The notion of a handmade product resonates deeply with us at Wallpaper*, especially when it comes to our shoes. 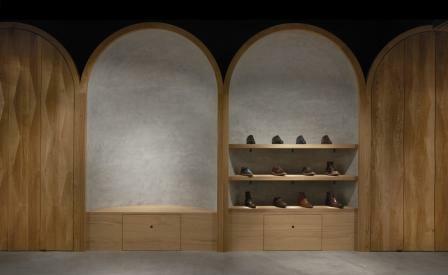 Which explains why the new store for Norwegian shoemaker Faust – which produces both ready-to-wear and handmade shoes – has struck such a chord. Architecture studio Snøhetta took its brief seriously, creating not just the interiors of the store in Oslo’s buzzy Barcode Project, but also the entire brand identity including web design and business cards, right down to a customised typeface that’s based on 17th-century manuscripts for the signage and business cards. The showstopper, though, is the interior. Here, Snøhetta has created a space that is positively Gothic in its moody romanticism and sly homage to Goethe. The entire length of one wall is lined with five vaulted concrete niches interspersed with perfectly milled and oiled oak doors. The latter slide open to reveal shoe boxes and, literally, the tools of the trade – the instruments and leather swatches that transform feet patterns into lasts and, ultimately, finished shoes.